Those with a great business idea or a project can always turn to a crowdfunding platform like Kickstarter to help fuel their entrepreneurial dreams. But crowdsourcing donations, however – like trying to raise funds for victims of a natural disaster or a child fighting cancer – has been near impossible. Enter a website called GoFundMe.com. San-Diego, California-based GoFundMe essentially is a crowdfunding platform that lets someone collect donations for a personal cause or a life event. 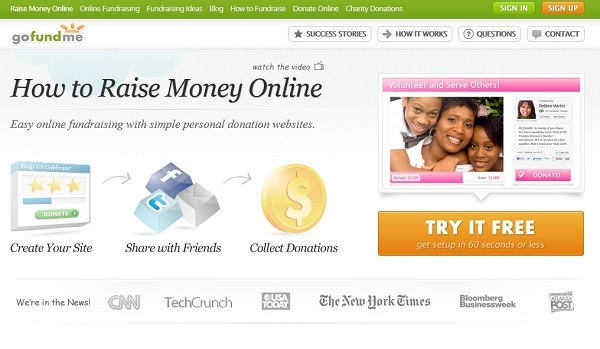 The site lets users manage their campaigns, thank donors and even communicate with supporters. GoFundMe deducts a 5% fee from payments users receive, and never charges donors. Founded by interaction designer Brad Damphousse and software engineer Andrew Ballester, GoFundMe was first conceptualized back in 2008 when both were driven by personal tragedies that led to want to use their talents for good. “We said, ‘Let’s create something that really benefits the world,’” shares Damphousse. By September that year they would launch what would be one of the first crowdfunding sites on the Internet. But online payment technology didn’t catch up with their vision, until now. “It wasn’t until 2010 that online payment technology finally enabled us to have the right business model for our users: one that allowed users to sign up quickly and easily, create their donation page, share it via Facebook and Twitter, and begin attracting support for causes that matter to them most,” says Damphousse, whose company is completely bootstrapped. How successful have they been? Well, some of their users have gone on to garner high-profile media attention – a campaign for America’s tallest man to help him pay for custom-made shoes and restore his mobility, a donation page to help a New England teen get his license to become the country’s youngest helicopter pilot, and the most successful GoFundMe campaign yet, to help pay for the astronomical medical costs mounting for a young woman who was a victim in the Colorado theater shootings. The company has seen 20% average monthly growth in the last year, is on track to handle $3 million in donations this August alone, and projects a total of nearly $40 million in 2012. “GoFundMe is quickly becoming the place where friends and families come together and make a real difference in one another’s lives,” Damphousse concludes.